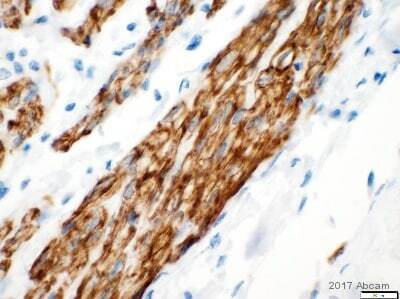 This antibody is highly reactive with desmin. On immunoblots only the 56 kD desmin band is stained. Non reactive with GFAP, Keratin, Vimentin and Neurofilament. Tissue, cells or virus. Immunogen derived from human Leiomyoma. Our Abpromise guarantee covers the use of ab8470 in the following tested applications. 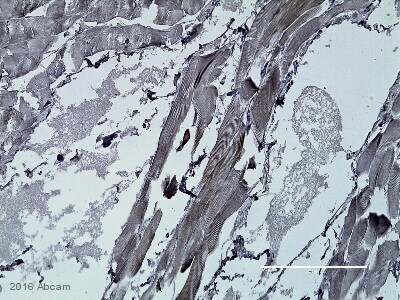 IHC image of ab8470 staining in human skeletal muscle formalin fixed paraffin embedded tissue section, performed on a Leica BondTM system using the standard protocol F. The section was pre-treated using heat mediated antigen retrieval with sodium citrate buffer (pH6, epitope retrieval solution 1) for 20 mins. The section was then incubated with ab8470, 1µg/ml, for 15 mins at room temperature and detected using an HRP conjugated compact polymer system. DAB was used as the chromogen. The section was then counterstained with haematoxylin and mounted with DPX. Publishing research using ab8470? Please let us know so that we can cite the reference in this datasheet. I had a question regarding this product: On the data sheet, this product states to be a monoclonal. What is the clone number? Thank you for your enquiry. Ab8470 is clone D33. I have added this information to our online datasheet. Please contact us again if you have any additional questions. I have just received the feedback from our customer. She send a protocoll and the answers to your questions: Staining Protokoll: 1. dewax 30 minutes, 100%Alkohol, 96 % Alkohol, 80% Alkohol, 70% Alkohol: 6 minutes 2. dest. water: 5 min. 3. Mikrowave: 800 watt, 2 x 5 min. in citrate buffer for antigen retrieval: Cooling for 20 min. 4. Using Dako Pen, 2 x 5 min TBS Buffer 5. 3 % H2O2 in dest. Water for 20 min. 6. 2 x 5 min. TBST buffer 7. Normal Serum from rabbit: 10 % in BSA(1%)/TBS: 90 min. in sandwich box 8: prim. Antibody 1:50 in PBS: overnight at 5°C in sandwich box ( ca. 18 hours) 9: 2 x 5 min. TBST buffer 10. Sek. Antibody: 1:100 in BSA/TBS: 90 min. at Roomtemperature in sandwich box. 11. 2x 5 min. TBST buffer 12. Avidin-Biotin Komplex in BSA/TBS: 30 min. in sandwich box 13. 2 x 5 min. TBS buffer 14. DAB (Dako) : 10 min. in sandwich box. 15. dest. water: 5 min. 16. Hämatoxylin (Mayer) : 2-3 min., water Question 1: No staining in skelatal muscle from neck or temple. 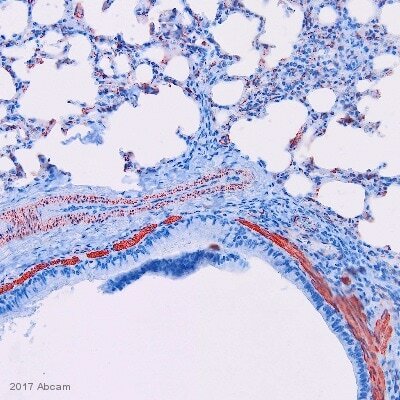 Question 2: Human muscle from heart, colon: positiv staining, but not in every case Human muscle from neck or temple: no staining Question 3: 4% Formaldehyd buffered Question 4 and 5: Microwave: s. Protokoll Question 6: Mouse monoclonal to Desmin igG1 (ab 8470) testet dilutions: 1:50, 1:100, 1:200 tested incubation times: overnight at 5°C, 2 hours at 37°C Question 7: Polyclonal Rabbit Anti Mouse iG , biotinylated Rabbit F(ab')2 reacts with all mouse IgG subclasses and mouse IgM, and it will probably also react with other mouse immunoglobulins via their light chains. I dont think, that the problems coming from the secondary antibody. I become a positiv staining with materail from colon and heart. tested dilutions: 1:50, 1:100, 1:200 tested incubation: 1 hour at 37°C, 90 min. RT, 120 min. 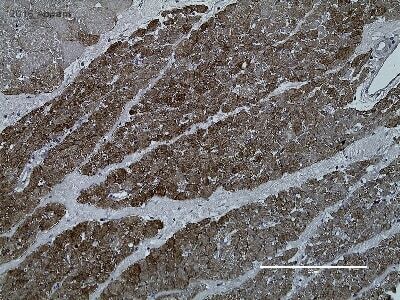 RT Question 8: a very low background staining Question 10: Negativ controlls: Tissue from Dermis, Tissue without prim. 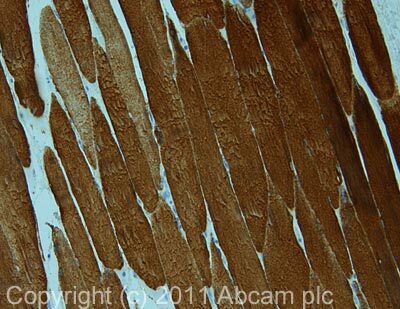 Antibody Positiv controlls: Tissue from colon Question 11: IHC in skelatal muscle: 8 times: everytime negativ IHC in smooth muscle: 2 times: positiv, with best results in some tissues from heart and colon. I choose cases from 2002 to 2004. Different regions from heart and colon. But not everywhere I will become a positiv result. But from 90 % and that everytime. I changed the dilution, the solvent, the time, the temperature, detection method: ABC or LSAB II Hopefully this will help to clarify the case. If I can be of any further assistence, please let me know. Thank you for your patience. 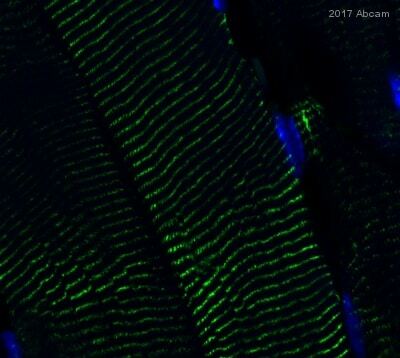 The antibody should work very well in skeletal muscle, unless it is myopathic. 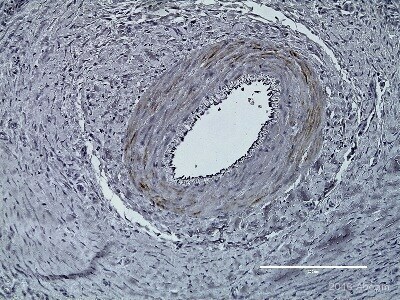 With skeletal myopathy lack of demin occurs. We recommend as positive controls skeleton muscle, rhabdomyosarcomas and leiomyoma cells. We would also advise to use pretreatment: Heat Induced Epitope Retrieval (HIER) techniques. Have you tested this antibody for reactivity on other species such as mouse ? If is not the case, it is possible to buy a small quantity to test it. Thanks Peggy ADIN. This antibody has not been tested in any other species except human. Unfortunately, it is not possible to purchase a smaller quantity for testing purposes. Cross reactivity with rat has not yet been tested. Unfortunately we do not think that this antibody will cross react with rat.